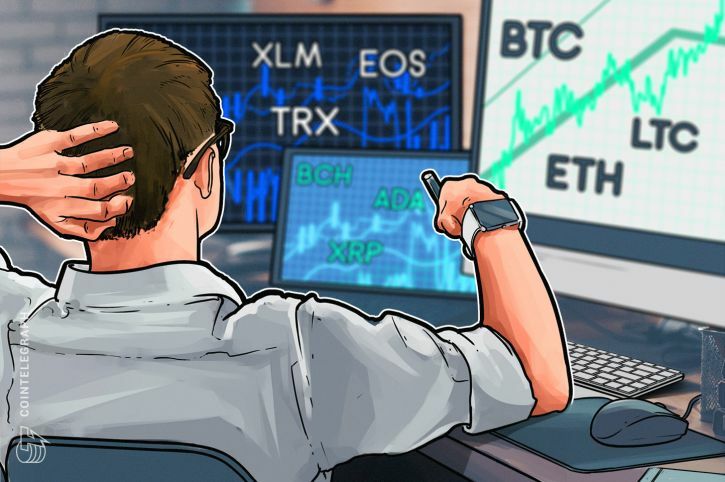 Latest technical analysis on top 9 cryptocurrencies from an expert trader. The next leg of the bull run will be sparked by the gush of institutional money waiting to enter the crypto markets. Existing operators realize this and are exploring options to improve their products to suit the institutional players. Coinbase is rumored to be eyeing a federal banking license, which will help it attract larger customers. Realizing the vast potential, venture capital firms are laying the groundwork to increase their investments in cryptocurrencies. The firm behind Snapchat, Lightspeed is the latest to join the others like Comcast Ventures and the Rockefeller family’s venture capital arm Venrock who are looking to build their crypto exposure. We have been pointing to the various news related to institutional investors because this shows the kind of interest they have even after the decline in prices. The retail investors should take this in consideration and might think about investing for the long-term purposes on any decline due to negative news. But also think about keeping money to trade on the peaks and the valleys because the digital currencies are volatile and may offer many opportunities. Let’s see if we find any buy setups today. We shall look at the chart of the oldest cryptocurrency from a slightly long-term perspective today. After last year’s massive rally, Bitcoin is currently consolidating the gains inside a large range of $6,075.04-$12,172.43. Since March of this year, the moving averages have been criss-crossing each other, which also confirms that there is no trend currently in play. Inside the large range, another smaller range is developing, which has resistance at $10,000 and support at $7,941.68. This offers the traders an opportunity to lock in about $2,000 in profits if the range-bound trading persists. Therefore, traders can buy the BTC/USD pair on any decline close to the support of $7,941.68 with a suitable stop loss. The target objective of this trade is a move back to $10,000. This trade suggestion will be invalidated if prices sink below $7941.68 and fail to recover quickly. In such a condition, the positions should be closed because the next support on the downside is at $7,000. Ethereum ended its correction by a sharp ‘V’ shaped bottom formation. We had anticipated the start of a new trend once prices broke out of $745, however, the higher levels attracted selling and prices fell to $637 levels where buying emerged. Though the digital currency has formed a bearish head and shoulders pattern, the bears have failed to achieve a close below the neckline of the pattern. The ETH/USD pair is looking strong because it has been consolidating close to the overhead resistance for the past few days. We believe that a breakout above $745 will start a new uptrend that can carry it to $1,000 levels, with a minor resistance at $838. Our bullish view will be invalidated if the bears force a breakdown below the 50-day SMA. In such a circumstance, we anticipate a decline to $418 with minor support at $544 and $464 levels. Since February of this year, Ripple has been trading in a broad range. The attempt to break down of the range in end-March did not find sellers at lower levels and prices climbed back into the range. The subsequent rally failed to reach the upper end of the range at $1.22961, which shows lack of buying at higher levels. Currently, prices are again trending down and are trading below both the moving averages. The RSI is also close to 40 levels, which is a negative sign. A fall to the critical support level of $0.56 is probable. Our bearish view will be invalidated if the XRP/USD pair rallies and sustains above $0.75 levels. We shall wait for prices to find support before suggesting any trade on it. Bitcoin Cash broke out of the overhead resistance at $1,600 on May 05 but could not sustain the higher levels. It again fell back into the range on May 10 and subsequently declined to the 50-day SMA. In doing so, it has formed a head and shoulders pattern, which has a target objective of $650. Usually, in a range, after failing to break out of the overhead resistance, prices decline to the support of the range. Hence, we expect the BCH/USD pair to slide lower once it breaks below the 50-day SMA. Our bearish view will be invalidated if the bulls break out of the 20-day EMA and sustain above it. We shall buy the cryptocurrency again after it breaks out of $1,600. At the present levels, we don’t find any buy setups that can be traded. EOS has held the 50-day SMA support, which is close to the 61.8 percent Fibonacci retracement level of the recent rally. On the upside, the bears are defending the 20-day EMA. We will either get a break out above the 20-day EMA and the descending channel or a breakdown below the 50-day SMA, within the next couple of days. If the EOS/USD pair breaks out and sustains above $14.5, traders can enter long positions, which can be held with an initial stop below the recent lows. The target objective is a rally to $18.67 and higher. However, if prices re-enter the channel after breaking out, it will signal weakness and the trades should be closed. In case of a breakdown of the 50-day SMA, the fall can extend to $10 levels with minor support at the May 16 lows of $11.821. Hence, no trade should be attempted inside the channel. Litecoin has continued to make lower peaks since topping out on December 19. This shows that the bulls are unwilling to support prices at higher levels. The only small consolation is that the support of $107 has held in 2018. The LTC/USD pair has formed a bearish descending triangle pattern, which will complete on a breakdown below the critical support of $107. The bulls are currently defending the $127 levels. A break below $127 can sink the digital currency to $115 levels. Price is quoting below both the moving averages and the RSI is also below 50, which shows that the path of least resistance is to the downside. Our bearish view will be invalidated if price turns around and sustains above the moving averages. There was a request to provide analysis of ADAUSD like the other top currencies, instead of ADABTC, hence, the change today. Cardano is also in a bottom formation. It has major resistance at $0.436956 from where it has returned twice, as shown in the chart. Once this level is crossed, we can expect a new uptrend to begin. Until then, the cryptocurrency will remain range bound. Currently, the ADA/USD pair is trying to find support at the $0.23 levels. If this level holds, traders can buy closer to $0.30 for a target objective of $0.4. The stops can be kept just below the recent lows. If the bears break below the $0.23 levels, a fall to the lower end of the range is likely. Stellar bounced off the neckline of the head and shoulders pattern but is currently facing resistance at the downtrend line and the 50-day SMA. The bearish setup will complete only on a breakdown and close (UTC time frame) below the neckline, which will sink the digital currency to $0.2 levels. We shall change our negative view once the XLM/USD pair sustains above the 20-day EMA. That will indicate strength and a probable move towards the overhead resistance of $0.47766719. The digital currency will start a new uptrend once it breaks out of this resistance. Currently, there are no buy setups, hence, we shall remain on the sidelines. TRX is showing strength while the other altcoins are struggling to move up. It is trading above both its moving averages, which is a bullish sign. It is the ninth largest cryptocurrency by market capitalization, hence, has secured a place in our analysis. Since mid-January of this year, it has been in a bottom formation, which will complete on a breakout and close above the overhead resistance at $0.09229053, from where prices had turned down in mid-January and in early-May. A breakout has a minimum price target of $0.1607 levels, though we expect higher levels. If the TRX/USD pair fails to break out and sustain above the overhead resistance, it will correct to the 20-day EMA. We suggest waiting for the breakout or a retracement to initiate long positions.